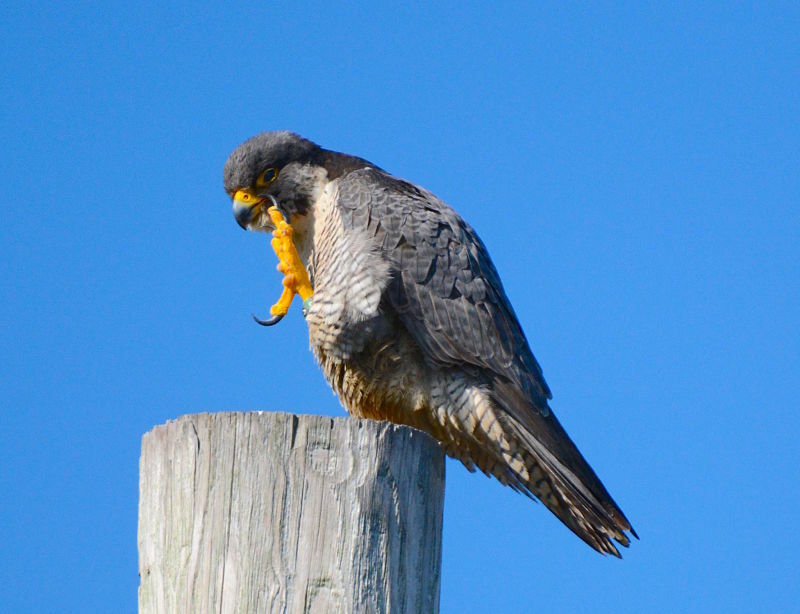 On Wednesday February 17, birder Gary Reardon enjoyed a rare sighting, a Peregrine Falcon perched on a pole on Smith Neck Road in Dartmouth. 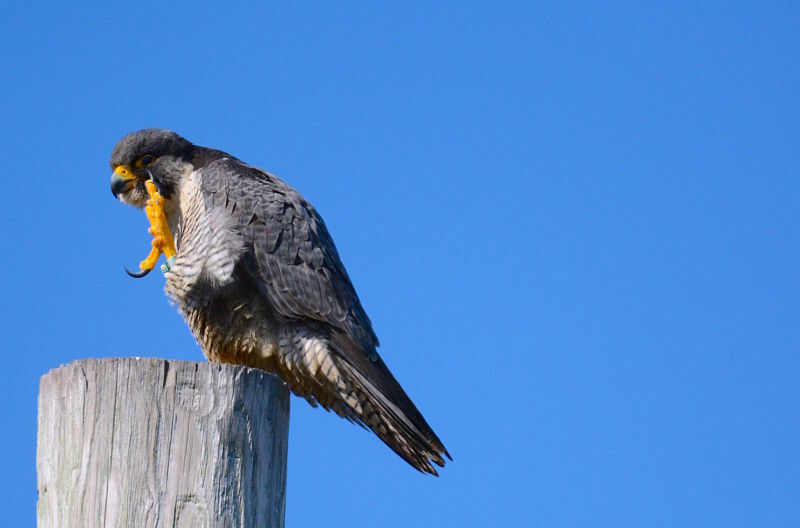 Peregrines here along the coast are most often seen in fall and winter, after nesting is complete and both adults and juveniles have dispersed from nesting sites to the shoreline, where they are often seen in flight along beaches in search of a meal. 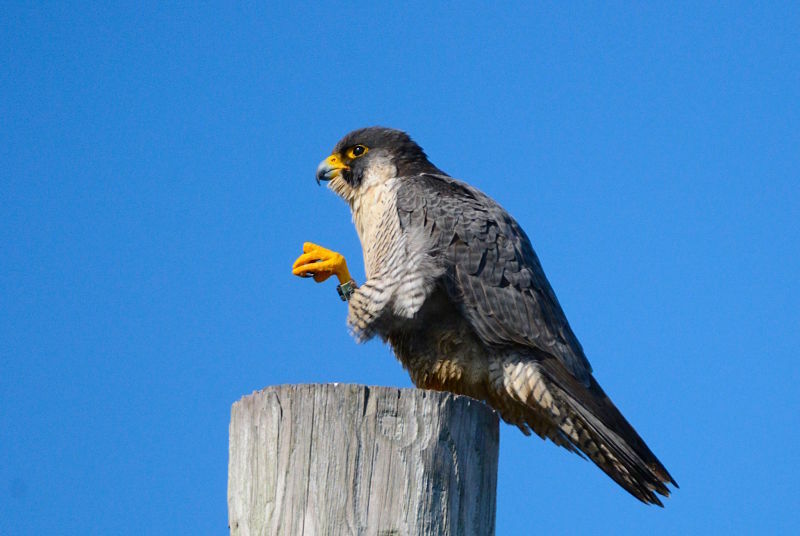 Peregrines are known to be the earth’s fastest birds, clocked at over 200 mph during dives in pursuit of their avian prey they are well equipped to capture (Masswildlife NHESP species account 2015). They are readily identified by a prominent “mustache”. 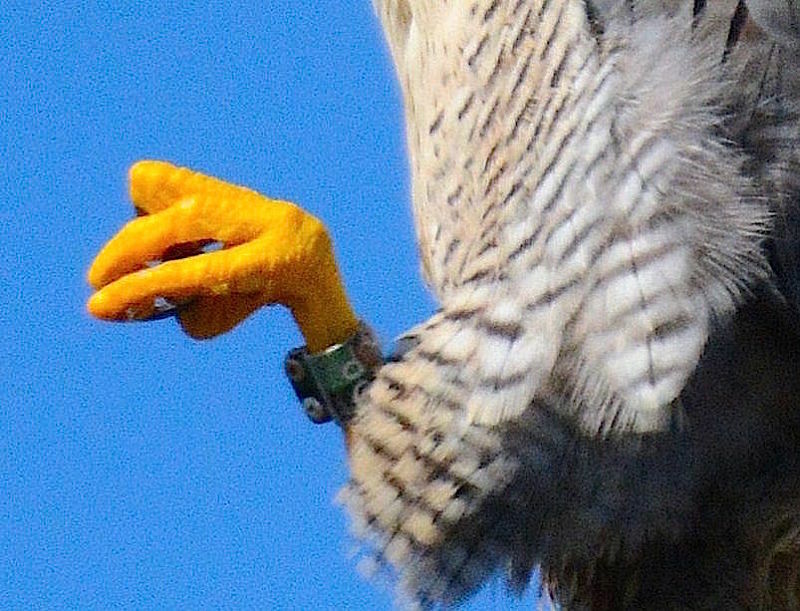 This Peregrine was also banded, and we’re attempting to determine the bird’s history at this time. Peregrine Falcons were unfortunate victims of DDT use, which caused eggshell thinning, and the species declined from historical nesting areas. The Peregrine Fund of Cornell University in New York initially began a program of captive breeding and releasing young peregrine chicks in the mid-70’s, and the Peregrine restoration was the first new program for the Massachusetts “Nongame and Endangered Species Program” in the early 80’s. Today Peregrines are “endangered” in Massachusetts. Peregrines don’t construct nests and historically nested on cliffs. 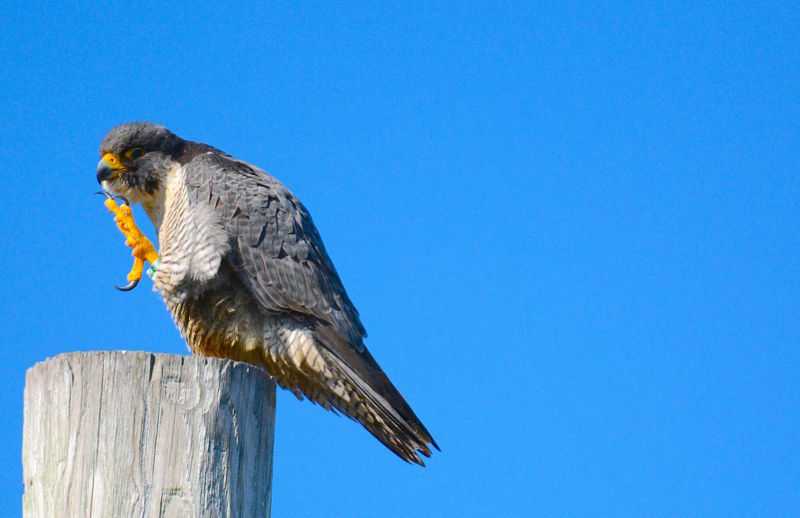 However, over time, Peregrines took to human-made structures including buildings, bridges, and cell towers, which resemble the high cliffs where birds nested in the past. While only six of the 14 historical nesting cliffs have been re-used, pair numbers jumped from 14 statewide in 2007, to approximately 30 in 2015. This is due largely to their adaptability to nesting on artificial structures, which has brought pairs as close as Fall River and downtown New Bedford! 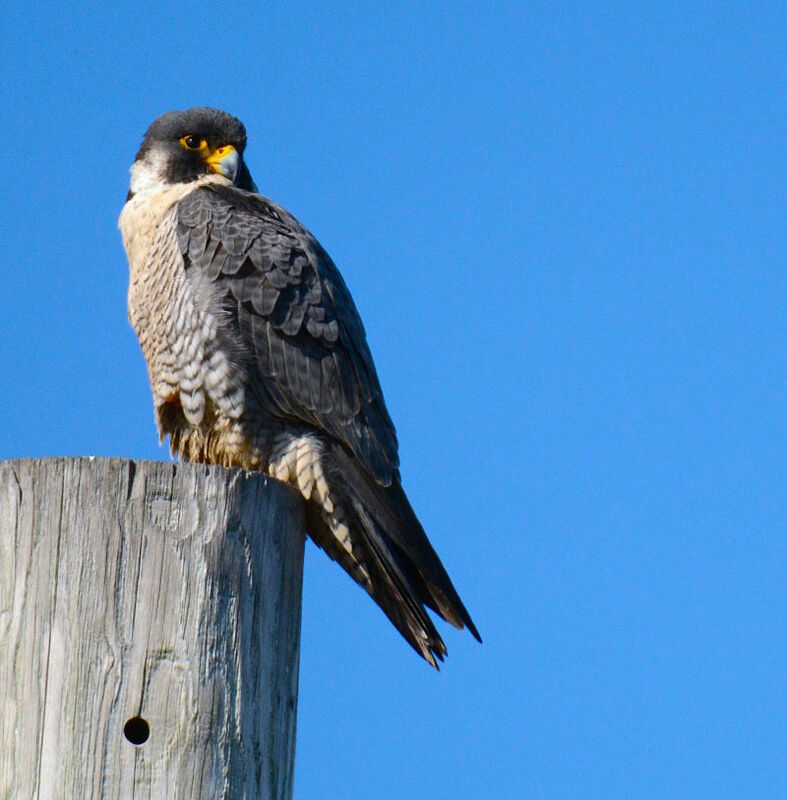 If you see a dark bird perched on a post such as this gem, or on a beach, or swooping along the shoreline over the water, good chance it’s a Peregrine Falcon!